For those familiar with Irish folklore, you may have heard of tales about meeting a fetch. In these tales, a fetch is a person’s own doppelganger. Usually the seeing of one’s fetch portends one of two things in Irish folktales: if one sees their fetch in the morning (i.e. your own image) it means you have a happy long life ahead, but if you see your fetch in the evening your death is very near. The word fetch also appears to be the Old English word equivalent to the Old Norse word Fylgja. In the Northern Tradition, the Fylgja is literally some sort of supernatural spirit that accompanies a person (or a familial line) in connection to their fate or fortune. They could appear as animals, or as women. You do NOT want to see one, as in the Northern Tradition it is considered an ill omen foreshadowing your impending death/doom. But a fylgja connected to a person wasn’t necessarily a bad thing (the seeing of one however was). So the presence of the fylgja usually went unnoticed and unremarked until people saw them before their death. So a fylgja could have protective qualities. We see in Ljósvetninga Saga that because Eyjólfr’s fylgja was weaker than his enemies, his fylgja couldn’t protect him from his misfortunes. I find it interesting to note that noted scholar Jenny Jochens writes in Old Images of Norse Women that fylgja, regardless of if they were animals or humans in how they appeared, were always considered female. Men and women both could have fylgja that appeared to them as animals. If you examine the Northern Tradition you do see a lot of connection with animals and the Gods. It’s probably some ancient, primitive tradition that evolved into that practice, but it significantly predates any remaining written record we have as to the origins of the tradition. Of note, only men had fylgja that appeared to them as women, which probably links back to ancestor worship, and derive from the type of rites and rituals we see connected with the Disir. Her text also looks to similar roles and depictions of women in other guises like the valkyries. We see a Fylgja illustrated once in the archaeological record, on the Franks Casket. There are references to them in several of the Sagas, the one that immediately comes to mind is Þórðr seeing a blood-covered goat in Njal’s Saga, which was taken to be a death omen. Similarly in the Eddic poem Helgaqviða Hjörvarðzsonar, we see a fylgja appear (like a woman riding with snake reins) and it was taken as an omen of impending death. In Gisli’s Saga he dreams of a woman covered in blood who comes and washes him in it. 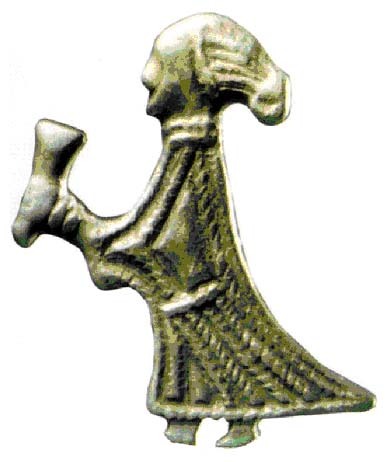 Pretty much anytime someone “dreams” of a women in the Sagas, this women was understood to be a fylgja.